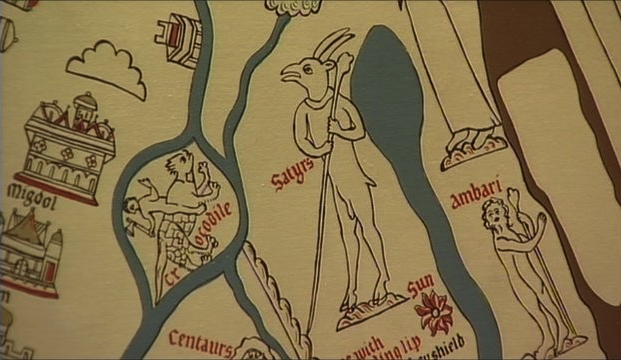 At the peripheries of the Mappa Mundi in Hereford (c 1300) are many strange creatures and peoples. The lynx sees through walls and produces a valuable carbuncle in its secret parts. The Manticore, in India, has a triple row of teeth in a man's face, a lion's body, a scorpion's tale and the voice of a Siren. Semi-humans such as the Phanesii, a bat-like people with enormous drooping ears, live in Asia, as do the Spopodes, who have horses's feet. The Agriophani Ethiopes eat only the flesh of panthers and lions; their king has one eye in his forehead. The Gangines of India live on the scent of apples of the forest and die instantly if they perceive any other smell. The Arimaspians fight with griffins for diamonds. Fully human but utterly foreign, and terrifying, are the Scythians: they love war, drink the blood of enemies from their gushing wounds, and make cups from their skulls. The Hyperboreans, by contrast, are the happiest race of men. They live without quarrelling and without sickness for as long as they like. Only when they are tired of living do they throw themselves from a prominent rock into the sea.